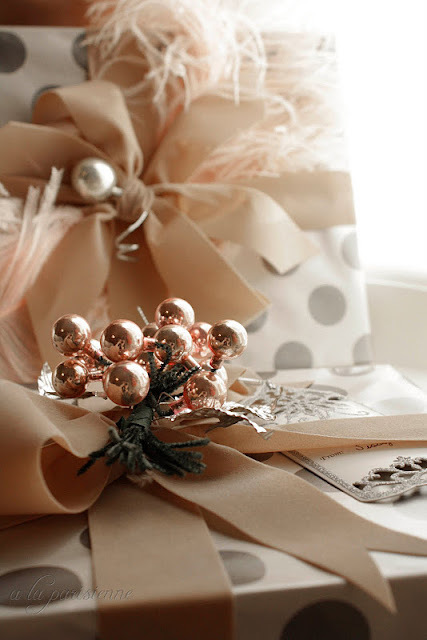 I have had an idea for sometime to dye French newspaper a pale pink tint for gift wrapping. This romantic gift by The Seven Gypsies has captured the look I was after here. 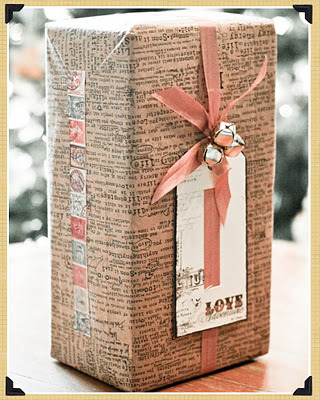 I love how she has used stamps to seal the edge and the beribboned gift tag. 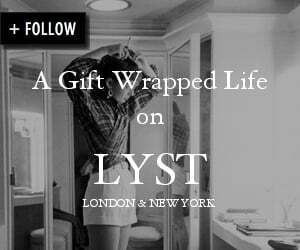 Gift wrapping by Mandy of the blog la Parisienne. Mandy of a la Parisienne share a mutual passion for presentation and dream that one day we will get the opportunity to create together. 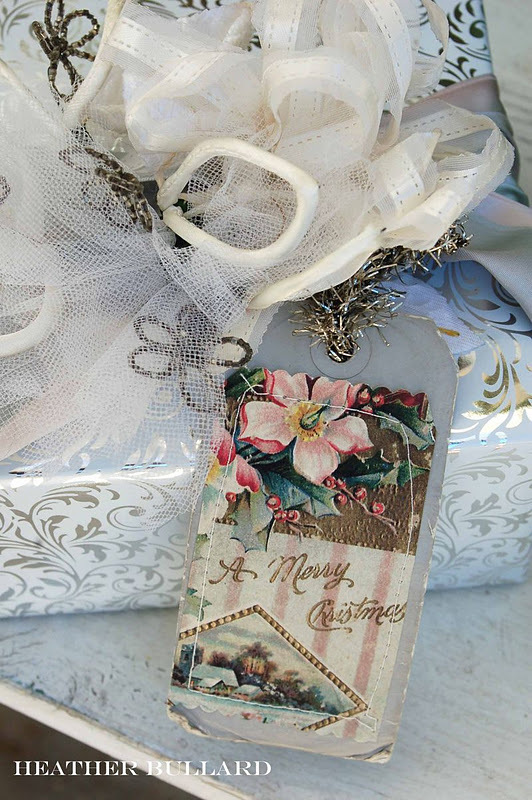 The link here will bring you to her popular blog's Gift Wrap section where you can see all her creations with a Paris flair............especially her very popular pink feather and gray tissue presentation. Heather Bullard is the undisputed queen of vintage wrapping into presentation of beautiful slendor. She is a good recycler too, often using vintage flowers, bits' of vintage ribbon and my personal fav............leftover wallpaper, especially the metallic ones with a romantic nature. 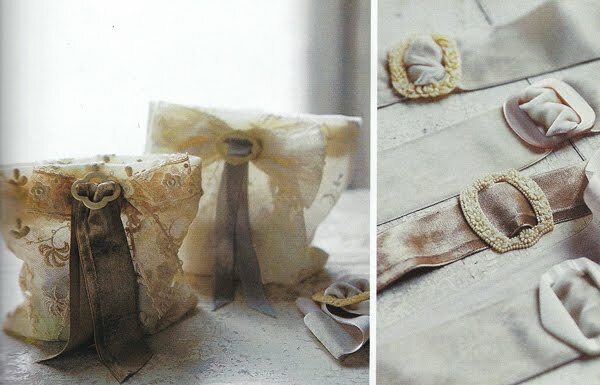 Embellished petite lace bags From Victoria Magazine June 2003 issue via Haute Design. Photos linked to source. Please advise if any link needs correction. Sande the special embellishments, netting, and tissue are the details that make the difference! I wanted to let you know that the Holiday Grand Finale Giveaway of the Star Cross Antique Bottle from Greyfreth is now available! 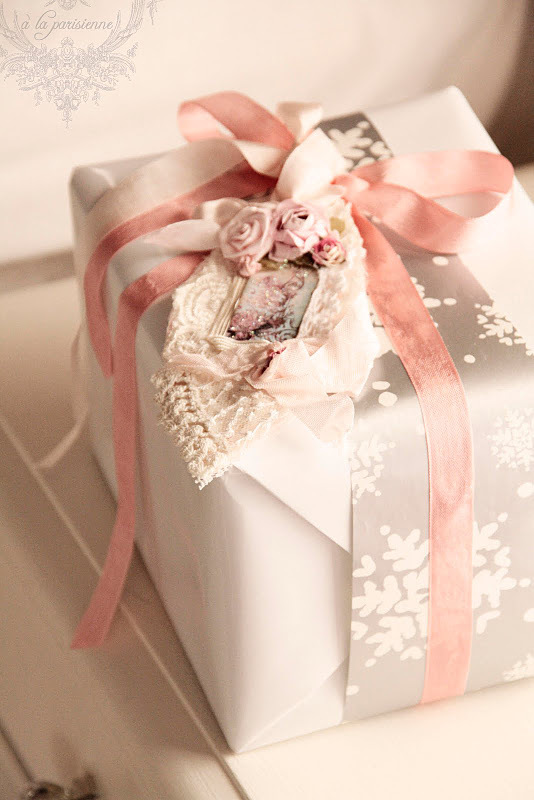 Oh my, oh my, oh my...These romantic giftwrapping ideas melt my heart! I have a little stash of vintage buckles that I hope to use on a very special gift one day-perhaps for my mother-in-law's upcoming birthday. I adore vintage adornments, and Heather Bullard is so talented!! Speaking of pale pink tinted newspaper, I have some tucked into the base of my other homemade Christmas tree...I just never had the time to "finish" it and photograph it. Maybe next year. I'm honored to be included in your line up of Romantics~I think you've placed me in the perfect catergory! Love the pink and black on Mandy's site....I'm lucky to just get some ribbon around a box and not using wrapping paper this year, but I am sooo impressed with the fine detail of these wrapping jobs! ps check your email!